Thanks for this! After doing this however, I’m getting a humming that’s coming from the internal Mac speakers. Any idea on how to fix that? Sam did U ever find out how to get rid of humming??? I noticed that the humming or static does not come out of the Master Device that is chosen. the static will switch as I switch which device is the master. Sample rate did not seem to affect it at all. did you ever get an answer to this? That’s exactly what I need, but, please, where is the “Audio Midi” setup application, in Yosemite? Thank you in advance! I have a half second delay between the speaker and my mac, any idea about how to solve it? I checked the drift correction box for the bluetooth device and don’t notice the delay. Me too.. Got a B&O A2 and A9 speaker but they do not play synchronized..like you a half second delay! I have a bluetooth speaker playing iTunes in my shop from my iMac, problem is I’d like to have all other functions on my computer use the internal speaker, such as youtube etc, Is that possible? Great, just what I wanted. Only problem is it seems like I can’t control the volume with the usual controls. Is there anyway to do this? I’m not certain though I ended up not using this feature for very long. These days I have the iMac set to send all sound output only to a Bluetooth speaker. I’ve also used this method in an attempt to send audio to two Bluetooth speakers at the same time. It was able to connect to both but in practice it didn’t work – the audio dropped on both speakers constantly – I don’t know if it was a limitation of the Bluetooth radio, the OS, or both. It seemed like it simply wasn’t capable of reliably sending an audio stream to two Bluetooth devices at the same time. I wasn’t very surprised as it’s probably not a common thing that someone would have a desire to do. Did you ever find out how to control the volume? I also get humming/crackling on internal speakers when external bluetooth speaker also selected. Pretty poor. Fantastic. It really feels amazing when something in this world is easy and just works. I have just installed a pair of bluetooth speakers on my iMac (Yosemite) because the audio out/headphones port died, after a good many years driving my original Apple external stereo speakers (a collectors item, that still work!). I found immediately that the sound quality from the bluetooth speakers was not good; choppy and crackling. After much experimenting I realised I had 3 other devices running in the bluetooth menu – keyboard, mouse and trackpad. Turning ONE off (trackpad in this instance) resulted in mush improved sound! They are good speakers (Sandstrom) 15w x 2 and I also use Boon2 to enhance the sound – now very happy. I maked it work and its crazy! but after changing to another song there is a half second delay! How can i fix that? Many thanks for this advice. But … unfortunately, I cannot change the volume by this new virtual device. get lots of lag I’m afraid, any idea how to sort this? Awesome!! Was able to do this within a minute. My external speakers are considered “built in output” when plugged in, so I cannot select the external speakers and the built in iMac speakers for the multi-output device. Is there a way to use both of these output devices as a multi-output device? Didn’t work for me. I have the aggregate set up but my Mac will still only output to one device. I have aa JBL Pulse 2 bluetooth speaker and speakers plugged into the headphone jack. I put the output to two different bluetooth speakers (Headphone and Harman/Kardon speaker), now I’m seeking for a possibility to send the left chanel to both chanels of one device and right chanel to both chanels of another device? sorry for late reply. i’m thinking now about the same — want to purchase two bluetooth mono speakers and connect them together. Did your solution with two simultaneous work now? Have you tried to use aggregate device instead of multi-output to redefine channels? Try to change the master sound in your new profile audio agregate (multi output device) too…. It helped. My turned out that build-in as master, drift correction checked for both to be the best. Increase sample rate might help too. 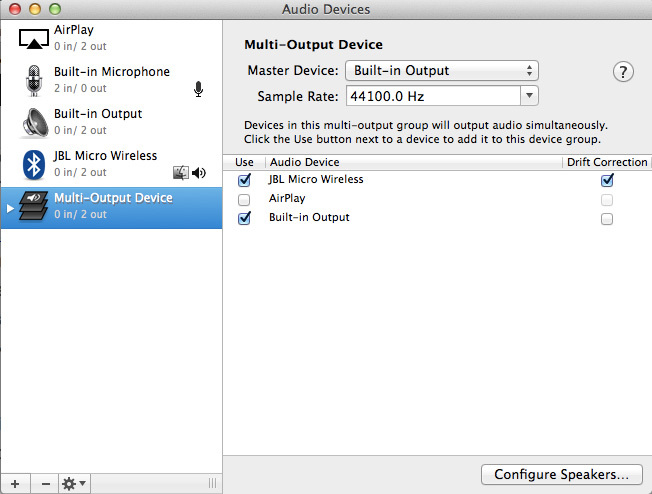 Thanks, This works well on OSX 10.11.3 with a Jambox in another room–even with a bluetooth keyboard and mouse. Only annoyance is volume adjustment, which doesn’t work when on Multi-Output Device. I have to switch the output to just one device (Internal Speakers or Jambox), adjust the volume like normal, and then switch it back to Multi-Output Device. Works well enough, but interrupts audio in the other room. Didn’t work. After making an aggregate device and selecting built-in and bluetooth i get “The selected device has no output controls” when I go to system preferences sound output. I press play on itunes and the sound output automatically changes from aggregate device to only bluetooth. 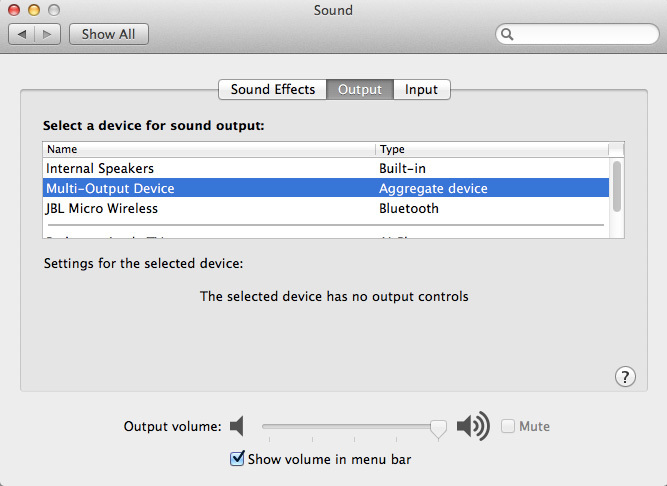 great this .. only this is that when I followed the steps above I can not alter volume via imac or my bluetooth speakers? If you go to the AUDIO MIDI Setup-> Sow Audio Devices. Click on Built-in output and/or your bluetooth output. It will show two bars, numbered 1 and 2, for changing volume 1. Didn’t work. Using 2 OontZ Angle speakers on a Macbook Air. Bluetooth icon shows both OontZ’s as connected. Icon does not show Multi-Output Device – should it? Getting sound only through one speaker and very choppy at that. Preferences/Sound shows both speakers and Multi-Output Device. Speaker types are Bluetooth – Multi-Output Device type is Aggregate device. Only other Bluetooth device is mouse which I disconnected to no avail. Fantastic, Just works in Sierra. This Xmas buyer 3 bt speaker and they works simultaneously. Amazing! Still getting horrible buzzing in my bluetooth JBL speaker. Any help? Perfect! Now my Holiday Party is really gonna rock! Wanted to offer a tip for those lamenting the loss of their volume button functionality. Which is indeed mighty lamentable, verging on infuriating. I haven’t tested it much, but the tip is as follows: If you are in whatever app your music or sound is coming from, try holding Shift and hitting the up or down keys. So far I’ve tried it in Amazon Music, as well as watching Netflix in Safari. Worked brilliantly both times. I presume it would behave similarly elsewhere. Obviously not as good a hitting a single button that will globally change volume regardless of the app you’re in, but at least it spares you the need to go mousing around for a tiny volume slider. I apologize… Still new to my new iMac which much to my beloved with the PC is being slowly lured to my beautiful new toy. I can not find this option on my iMac. I’ve open Midi Setting and it does not give me the multi-device option. What am I missing? Getting ready to buy additional speakers. Do I need to add the speakers before I have that ability? Would Bluetooth or wired speakers be recommended?